Kongo Near-Death Experiences: Cross-Cultural Patterns • James McClenon, Ph.D.
An 18th Century Near-Death Experience: The Case of George de Benneville • Ken R. Vincent, Ed.D., & John C. Morgan, D.Min. 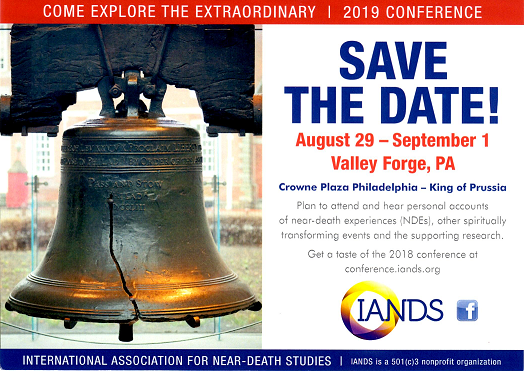 Six Major Challenges Faced by Near-Death Experiencers • Yolaine M. Stout, B.A., Linda A. Jacquin, C.A.S., & P. M. H. Atwater, L.H.D. Letter to the Editor: An objective correlate of consciousness • Denis Purcell, M.S.E.E. A Prospectively Studied Near-Death Experience with Corroborated Out-of-Body Perceptions and Unexplained Healing • Penny Sartori, R.G.N, Ph.D., Paul Badham, Ph.D., & Peter Fenwick, M.B.B.Chir., D.P.M. Failure to Elicit Near-Death Experiences in Induced Cardiac Arrest • Bruce Greyson, M.D., Janice M. Holden, Ed.D., & J. Paul Mounsey, Ph.D., M.B.B.Ch. Out-of-Body Experiences: All in the Brain? • Janice M. Holden, Ed.D., Jeffrey Long, M.D., & Jason MacLurg, M.D. An Ocular Physiological Explanation for Visual Sensations in Near-Death Experiences • Einar Stefansson, M.D., Ph.D., Sindri Traustason, B.Sc., & Thor Eysteinsson, Ph.D.
A Near-Death Experience in Pu Songling's Strange Stories from Liaozhai's Studio • Juan S. Gomez-Jeria, Lic.Q. The Day I Died: The Mind, the Brain, and Near-Death Experiences, produced by Kate Broome • Reviewed by Janice M. Holden, Ed.D., Jason MacLurg, M.D., & Debbie James, M.S.N., R.N., C.C.R.N., C.N.S. Letter to the Editor: Seventeenth-century cases of deathbed apparitions of birds • Carlos S. Alvarado, Ph.D. Does the Arousal System Contribute to Near-Death and Out-of-Body Experiences? A Summary and Response • Jeffrey Long, M.D., & Janice Miner Holden, Ed.D. From Fear to Love in Gay and Lesbian Near-Death Experiences and the Coming Out Process • Liz Dale, Ph.D. Remarks on Ernesto Bozzano's La Psiche Domina la Materia • Carlos S. Alvarado, Ph.D.
Obituary: Ian Stevenson, M.D. • Bruce Greyson, M.D. Obituary: Rhea White, M.L.S. • Bruce Greyson, M.D. Does Paranormal Perception Occur in NDEs? • Keith Augustine, M.A. Comments on "Does Paranormal Perception Occur in NDEs?" • Bruce Greyson, M.D. The Other Shoe Drops: Commentary on "Does Paranormal Perception Occur in NDEs?" • Kimberly Clark Sharp, M.S.W. Commentary on "Does Paranormal Perception Occur in NDEs?" • Charles T. Tart, Ph.D.
Commentary on "Does Paranormal Perception Occur in NDEs?" • Michael B. Sabom, M.D. "Does Paranormal Perception Occur in NDEs?" Defended • Keith Augustine, M.A.